Denver&apos;s first brewpub, The Wynkoop Brewing Company (co-founded in 1988 by former Denver Mayor John Hickenlooper, now Colorado&apos;s Governor) produces more than 4,000 barrels of fresh beer annually, earning it a place among the largest brewpubs in the world. Housed in LoDo&apos;s 1899-built J.S. Brown Mercantile building, The Wynkoop is packed with 22 pool tables, multiple dart boards and other bar games, but the beer is the main attraction for suds aficionados. Start with their flagship brew, the Railyard Ale, a smooth, amber beer that combines the malty goodness of an Oktoberfest lager with the slight fruitiness of an ale. TIP: Ask what&apos;s on the cask-conditioned rotator tap. The Wynkoop rotates cask-conditioned ales such as Quinn&apos;s Scottish Ale, the Churchyard Ale or the Splatz Porter, each with its own cult following among in-the-know beer drinkers. The minds behind Rock Bottom Brewery, with locations on the 16th Street Mall and in the Denver Tech Center, believe that the best beer is the freshest beer. All of Rock Bottom&apos;s beer (40,000 barrels yearly, the highest volume of beer in the restaurant brewery category) is handcrafted onsite, by dedicated brewmasters with a reverence for the rich traditions of brewing. As a result, beer experts have piled on the accolades, naming it the "Large Brewpub and Large Brewpub Brewer of the Year" at the 2008 Great American Beer Festival. Try Molly&apos;s Titanic Brown Ale (so named for Denver&apos;s famed "unsinkable" Molly Brown), an English-style ale that finely balances malt flavor and hops. TIP: On Fridays evenings in the summer, Rock Bottom on the 16th Street Mall hosts a rockin&apos; outdoor concert series, featuring beloved local bands. Like so many brewpubs, Breckenridge Brewery started out modestly in a home brewer&apos;s basement. Today, Breckenridge Brewery satisfies the thirsts of discerning beer drinkers at three locations in Colorado with such unique brews as Agave Wheat (created using the nectar of Salmiana Agave), Trademark Pale Ale (boasting hearty amounts of pale and Munich malts) and Oatmeal Stout (a bold, smooth-bodied concoction that magically combines dark-roasted coffee aromas and flavors of espresso and semi-sweet chocolate). Opened in 1992, the downtown Denver location is just a block from Coors Field, home of the Colorado Rockies. TIP: Ask about Breckenridge&apos;s 471 Small Batch series -- big tastes in limited releases. The Extra ESB is particularly beloved by Denver beer connoisseurs -- warming malt notes at the onset with a hop kick in the back, opening up to a nice dry finish. Thirteen Great American Beer Festival medals. Four World Beer Cup awards. Ranked 14th in Ratebeer.com&apos;s 2008 "The Best Brewers in the World." Ranked seventh in Beer Advocate&apos;s "All-Time Top Breweries on Planet Earth." Yes, Denver&apos;s Great Divide Brewery, has racked up its fair share of awards and acclaim since its founding in 1994 -- so many that it has become a must-visit destination for beer lovers worldwide. At the Great Divide&apos;s Tap Room in Downtown Denver, sample any of their beers on tap or in bottles, as well as the occasional Tap Room-only special release. Grab a seat on the patio and toast Denver&apos;s beautiful skyline with some of Colorado&apos;s finest beers. Or get some Great Divide to go: choose from a full selection of bottled beers, available in either 4 or 6-packs or in 22 oz. bottles. Bring in a growler and the brewers will fill it to the brim. TIP: Check the website for Great Divide&apos;s monthly beer and cheese pairings at the Tap Room. For $10, attendees get five cheeses, paired with five beers, garnished with artisan bread, nuts and fruit. Falling Rock Taphouse takes beer appreciation seriously, with more than 69 beers on tap and even more bottled beer, including what is probably the most extensive selection of Colorado-brewed beer under one roof in the world. All beer on tap is craft brewed -- "no contract brews or megaswill" they proudly state on their website. Just a block away from Coors Field in LoDo, Falling Rock regularly takes top prize in Westword&apos;s annual Best Beer List competition -- they&apos;re tough to beat! TIP: Ask about Falling Rock&apos;s selection of cask-conditioned brews -- unfiltered and un-pasteurized beer, which is conditioned (including secondary fermentation) and served from a cask without additional nitrogen or carbon dioxide pressure. Ice cold brews and baseball -- a match made in heaven. Just behind right field at LoDo&apos;s Coors Field (home of the Colorado Rockies) sits The Blue Moon Brewery at the Sandlot. A bit of a contradiction in terms, this is a microbrewery that&apos;s run by a mega-brewery -- MillerCoors. But the beer served is mainly of the craft variety, centered on Blue Moon beers, which were first brewed right here in Denver. Their Belgian White Ale was their first claim to fame, and took away top prize at the World Beer Championships. It&apos;s an unfiltered Belgian-style wheat ale with deep flavor and a uniquely cloudy appearance. The brewers suggest you try it with a slice of orange to bring out the natural spices and subtle fruit flavor. TIP: Every summer, Blue Moon makes a handful of special brews that are exclusive to Coors Field -- ask the brewers what&apos;s on tap, and enjoy a cold one while the Rockies play. Vine Street Tavern, one of the newest and grooviest additions to Denver&apos;s microbrewery scene, is all about the Grateful Dead on the sound system, juicy burgers (or veggie burgers) and a dedication to lovingly crafted beer. A sister brewery to the Mountain Sun and Southern Sun breweries in Boulder, the beers brewed and served here have won medals across the globe, including six gold medals at the Great American Beer Festival. Start with a Colorado Kind, a deep amber ale dry hopped with whole flower and cascade hops -- as satisfying as a Denver skyline sunset. TIP: Ask your server what Vine Street has on its revolving "nitro" tap. This is filtered but not pasteurized beer pressurized with nitrogen, making for an even smoother drink. Euclid Hall&apos;s beer list was named among the top 5 best in the country by Esquire Magazinerecently. The writers raved: "Sessionable kolsches and pilsners hang next to porters and nitro-carbonated milk stouts on the Colorado-centric tap tower. A mathematical-themed bottle list spans from the introductory ("Arithmetic": Del Norte Orale Light Lager) to the more advanced ("Quantum Mechanics": Lost Abbey Lost & Found), with smart choices everywhere in between." TIP: Soak up the beer with an order of Euclid Hall&apos;s much-raved about Poutine, an inspired take on the Canadian dish. Fresh food and craft beer -- what more do you want? Located in the heart of lower downtown,Freshcraft boasts an ever-changing selection of the best craft beers in Colorado and beyond, not to mention some great eats. TIP: Not in the mood for a beer? The bartenders at Freshcraft can mix a mean cocktail, too -- and the wine list is nothing to shake a stick at either! Good beer is best enjoyed with friends, fresh air, and a bit of adventurous spirit to sharpen the palate. Located in the Riverfront neighborhood just west of downtown, Denver Beer Co. specializes in artisan and seasonal varieties of premium ales and lagers made from the best ingredients around. The tap list is constantly changing - you may get the fan-favorite Graham Cracker Porter, the delectable Peach Saison or the hoppier-than-thou Fresh Hop IPA. They&apos;re all fantastic examples of great Denver beer. The patio is always a happening place to enjoy great beer and some Mile High City sunshine. TIP: Keep an eye on Denver Beer Co.&apos;s website for future Beer Dinners, when the brewery teams up with a local foodcart, providing them with four hand-crafted brews to use as ingredients, as well as partners for the dishes. The first thing you&apos;ll notice is the view. Located in the lower Highlands neighborhood west of downtown, Amato&apos;s rooftop patio boasts a stunning panorama of Denver&apos;s skyline. Next, of course, you&apos;ll notice the beer. A collaborative effort by Breckenridge Brewery and Wynkoop Brewing Co., Amato&apos;s is a tribute to Colorado craft brewing with 42 Centennial State beers on tap. The beer lineup changes daily, so stop in often to try the Colorado craft industry&apos;s latest and greatest. TIP: Beer is just the beginning. Amato&apos;s boasts a handcrafted cocktail list, with drinks that are built with small-batch, Colorado-made liquors and local ingredients. Maybe Denver&apos;s Art District on Santa Fe should change its name to the Art (and Beer) District on Santa Fe. Renegade Brewing is that good. Founded by Brian and Khara O&apos;Connell in the summer of 2011, the brewery&apos;s "offensively delicious" brews were homebrewed initially. But friends and family encouraged the O&apos;Connells to take their beers to the people! One sip of their flagship brew, Ryeteous IPA, and you&apos;ll be a believer, too - the citrusy hops and spicy rye are irresistible. TIP: Renegade&apos;s friendly taphouse offers enticing daily specials. Ride your bike in on Tuesdays and you get $1 off. Wear a Renegade hat on Sundays and receive a dollar off your pours all day long. Check the website for more. Dry Dock is by no means the biggest brewery in the Denver area -- even after a 2009 expansion -- but it deserves a spot among the best. Since founding Dry Dock in 2005, owner/head brewer Kevin DeLange has won an impressive amount of awards for his creations, including a Gold Medal at the 2006 World Beer Championships for the HMS Victory ESB (Extra Special Bitter Ale) and a Silver Medal at the 2008 Great American Beer Festival for the SS Minnow Dark Mild. The tasting room at Dry Dock is open 2-9 p.m. Mon.-Thurs., noon-11 p.m. Fri. and Sat. and noon- 9 p.m. Sunday. Have a seat and drink a pint or get your growler or keg filled with Dry Dock&apos;s finest. TIP: On Fridays, Dry Dock features a special beer available for one day only. This specially prepared beer is naturally carbonated, served from a cask with a gravity tap, and is served at a warmer "cellar" temperature. Check the Web site for more details. Housed in a beautifully restored historic building just across from Coors Field, the Denver Chophouse & Brewery offers outdoor decks, live music, and fine dining. The beers the ChopHouse brews are fantastic, too. There are eight craft beers on tap, including such as a premium mild, pale ale; honey wheat; nut brown ale; oatmeal stout and extra special bitter. Cuisine ranges from burgers to filet mignon - anyone&apos;s tastes will be satisfied here. TIP: The ChopHouse also has a location at Denver International Airport, in case you&apos;re in need of a great craft brew before (or after) a flight. Find out why Denver has been dubbed the "Napa Valley of Beer." The Denver Microbrew Tour is a 1.5-mile guided walking tour in downtown Denver&apos;s historic LoDo (lower downtown) neighborhood. The tour includes 10 samples at four of downtown&apos;s best breweries and tap rooms, including Wynkoop Brewing Company, Breckenridge Colorado Craft, Falling Rock Tap House and Rock Bottom Restaurant & Brewery. The guides are bona fide Denver brew aficionados, so you&apos;ll come out of this tour knowing more about beer than you ever thought possible. In no other neighborhood is the Denver craft beer culture more visible than in the River North Art District (RiNo). Located just north of downtown, RiNo has transformed from an industrial landscape into one of the hippest spots in Denver, featuring art galleries, innovative businesses and a variety of craft breweries. Aspire Tours highlights a few of the microbreweries that stand out for innovation, quality and their unique perspective on craft beer, including Epic Brewing Company and Black Shirt Brewing Co. Sit back as a 12-passenger van drives you and your friends along South Broadway and Santa Fe Drive on a four-hour tour to three breweries. Mile High Tap Tours currently partners with Breckenridge Brewery, The Brew on Broadway, Saint Patrick&apos;s Brewing Company, Dead Hippie Brewing, Locavore Beer Works and 38 State Brewing Company. Being driven from brewpub to brewpub, from microbrewery to microbrewery, with VIP treatment at every turn? Not a bad way to spend a few hours! On the Denver Brews Cruise, you&apos;ll experience the distinct tastes and styles of three of downtown Denver&apos;s fine craft breweries: Pints Pub, Breckenridge Colorado Craft and Strange Craft Beer Company. From porters and stouts to Belgians, pale ales and lagers, Denver Brews Cruise is sure to satisfy everyone&apos;s craft cravings. Banjo Billy&apos;s Bus Tours now offers an insider&apos;s look at Denver&apos;s craft brewing scene! Banjo Billy&apos;s private Denver Brewery Tour includes visits to three local breweries aboard an old school bus redesigned to look like a hillbilly shack, with three pints of beer included. Check out the list of breweries and make your private tour request online or by calling 720-938-8885. With production of more than 17 million barrels of beer a year, the Coors Brewery (13th and Ford, Golden) is the largest single brewery in the world. Located 12 miles from downtown Denver, the brewery experience includes a 30-minute self-paced tour through the malting, brewing and packaging processes, sampling of Coors fine products in the hospitality lounge and shopping in the Coors & Co. gift shop. Samples are limited in quantity and available only to guests 21+ with a valid ID. Non-alcoholic beverages also available. 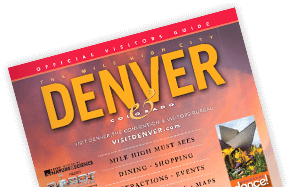 Tours cost $10 for non-Colorado residents and $5 for Colorado residents; tours are free for active duty military. For decades, Denver has been home to America&apos;s largest beer festival -- the Great American Beer Festival® (GABF®). This event is so huge that just to imbibe a one ounce sample of every beer offered would mean drinking over 108 regular 12-ounce bottles of beer! Over 325 American brewers participate in the festival, serving over 1,700 different beers, ales, stouts, porters and lagers, all competing for the most coveted medals in the industry. More than 30,000 beer-lovers come to the event each year, taking place in October at the Colorado Convention Center. www.greatamericanbeerfestival.com. Coinciding with the Great American Beer Festival® every year, Denver Beer Fest, a celebration of all things beer, includes beer tastings at local Denver restaurants, beer-paired dinners, "meet the brewer" nights, beer tappings, Denver brewery tours and a variety of entertaining beer events throughout the city.